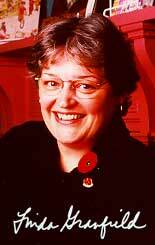 If Linda Granfield had another $30.00 in 1974, Canada may have lost one of its finest writers of juvenile nonfiction. "At the end of the second year in a Master's program at Northeastern University in Boston, I knew that I wanted to continue studying Victorian literature. It was $30.00 each for graduate school applications, and so I went to my Victorian lit. professor and said, 'I only have enough extra cash to apply to one school. Where's the best place to go for Victorian studies?' He replied, 'If you want to go far away, you go to Berkeley. Great program!' Having gone there, naturally he was partial. 'But,' he added. 'If you want to stay closer to home, you can go to Toronto." To which I responded, 'Where?' And he said, 'Toronto, Canada.' I knew about Alberta and BC and even Montreal because I listened to Montreal stations, but Toronto was not part of the Canada I knew. Nevertheless, I sent off my one application to the University of Toronto and got this letter back saying, 'Yes, we want you in the program.'" Despite living for over twenty-five years in Canada, Linda has a residual accent that still points to her November 22, 1950, birthplace, Medford, a Boston suburb. (She's now a dual US/Canadian citizen.) "After two years, we moved to another suburb, Melrose, which was built when the railroad grew out of Boston. A section of it, the Highlands, is where the railroad builders built their big mansions. I didn't live in one of them, but they were part of the history in our community. Actually, Melrose has quite a history. When I was working at the public library during my high school years, I used to walk by the house of Mary A. Livermore, one of the suffragettes. New York Times theater critic Brooks Atkinson grew up in Melrose, and Elizabeth George Speare who wrote Witch of Blackbird Pond lived in Melrose. The USS Constitution, the oldest, still-commissioned ship in the US Navy was built with oak from Melrose's forests of the 1700's. Living in a community with a fair bit of history put me in the direction I've my writing has taken." "Grade five seems to have been the key year in my life. My baby brother died the month before I started grade five, and sometimes I wonder how much that made me more aware of everything that was going on around me. That year's also when I read Little Women and decided I wanted to be a writer. I adapted the book into a play for my classmates, and it was supposed to be put on after Christmas vacation. The girl elected to play the long blonde-haired part of Amy, Paula Davis, had naturally long beautiful blonde hair. One of my key scenes involved one sister combing Amy's long hair while saying her lines. After the vacation, Paula took off her hat to reveal that her mother had cut all her hair off. We had to get yellow yarn and make this really ugly wig just so we could keep the scene." "In May, 1999, I was invited back to my home town for the first time to give readings at an author festival, and I said, 'I think my grade five teacher, Miss Goebel, is still living in the city. I'd love to find her.' Sure enough, they did, and we went back to my old school. It was a real thrill because Miss Goebel had been so supportive during that year. I can remember doing an explorer report in grade five, and I was assigned La Salle and the Mississippi. 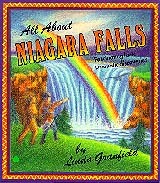 Years later, when I wrote the Niagara book, I discovered that La Salle was the first European to be at Niagara Falls. Everything I write points back to grade five and Miss Goebel's class." Linda's parents also each played a role in nurturing her imagination and interest in history. "Since there were seven of us children, there wasn't a lot of cash around for fancy vacations. When my dad took a summer holiday, he'd have a week off. Working in downtown Boston, he commuted every day of his work life. During his holidays, we kid's would each have a choice. 'What would you like to do for a day trip?' my parents would ask. Someone would suggest, 'Go to the beach' or 'Go to an amusement park.' And I would say, 'I want to go to the Freedom Trail in Boston.' There, we'd go on the famous Swan Boats and visit the Old State House where the Boston Massacre took place. My father was such a good-hearted man. Inside, he must have been saying, 'Oh no. I have a day off and I'm going back in there,' but he never did. Every year that was my vacation choice. My brothers and sisters, who liked the amusement park much more, were not too pleased with the day trip to Boston. But I liked it because you could touch history and everything came very alive. You could follow Paul Revere's ride, walk on the deck of 'Old Ironsides,' or see where the Battle of Bunker Hill was fought." "Grade five was also when I started a little handwritten, mimeographed newspaper. I still have a copy, and it's funny how you recall things because I thought my story was on page one. But the lead story, all handwritten by Peter, the editor and 'boy-who-always-knew-everything,' was an editorial: 'Let's be proud of Allan Shepard who just went up in space.' I was on page 3 with a report on the school flower show!" Linda's "journalism" career continued into higher grades, and "all through junior high, I worked on the school paper. During high school, I became the paper's literary editor, a strange assignment because I ended up doing things like interviewing cheerleaders and football players." "In high school, I also became the city high school 'news' reporter. The Melrose Free Press needed someone to report on high school news. This sounded really good. Maybe now I could do some real reporting instead of interviewing cheerleaders. My assignment? 'Every week we want you to send us over the school cafeteria menu.' I still have the actual articles, my first 'big city' stuff, where my by-line appeared over the listing: Monday: Macaroni and cheese, etc." "After high school, I went to Salem State College, in Massachusetts. My major was English, with two minors in Education and French. My original goal was to teach high school English, but, when I graduated in 1972, there was a teacher glut. 'OK,' I thought. 'Maybe if I go to graduate school, things will ease up in a couple of years.' I went to Northeastern University as a teaching assistant/graduate student and stayed in English before applying to the University of Toronto. Since I wanted to specialize in Victorian literature, I had done a summer program at Oxford with undergraduate credits. It was the first time I'd been out of the country and the first living on my own. Because the friend I roomed with hated every moment she was at Oxford, she didn't want to go anywhere, and I was free to wander and see whatever I wanted. It reinforced my love of history." "I arrived in Canada in August of 1974. Talk about the immigrant experience. I came with two pots, two towels, and a set of silverware in one suitcase, and my clothes in another. I found a room on Parkside Drive, near High Park, and started courses. I immediately loved the city and went, of course, through all the historic houses. I'd ask directions, and people would say things like, 'There's this really old house on the corner. You turn after that.' So, I'd be at an intersection in downtown Toronto looking around. 'Where's the old house? There's a red brick house, and modern hotels.' The 'old' house would be circa 1890, but, to me, an old house is wood construction of 1690's vintage. I developed a new sense of 'old.'" While Linda didn't finish her doctorate, she did meet her husband, Cal Smiley, at the University of Toronto. "He was specializing in Canadian literature, and we ended up in a class together. We didn't know each other when we first went to the class, but we watched the professor for five minutes and both made the same decision: we're getting out of this class right now. We didn't meet at the office trying to switch classes and both went to different classes, but each was full. Finally the 'Office' said, 'You're going to have to go back to the original class,' which now we see as fate. Cal finished his doctorate, but we were five years too young. The group five years ahead of us had the university teaching jobs. Cal put out 40 applications and had one interview for a nine month appointment. Looking in the paper, he saw a computer job for which they would train you. 'What have I got to lose?' said he, and so he has what our family calls 'the real job' and he's our 'patron of the arts in Canada.'" "Cal's very supportive of what I'm doing. It's only because I have a stable family life that I'm able to continue writing. It's sad, but I think that writing children's books is a luxury profession. I'm aware of it all the time. It's part of what makes it wonderful, but it's part of what makes it horrible because it puts the financial burden on your partner. There have been perks though. I've met interesting people and seen a great deal of Canada. My daughter Devon and son Brian have grown up with the wonderful opportunity to meet many children's authors and illustrators, some of whom are like family to them. My kids don't read any of what I write before it's published, but Cal reads drafts and listens as I bounce ideas off him. If you interviewed him, he'd probably chuckle and say, 'I don't mind when Linda finishes the first draft. Then I don't have to hear the day's progress reports every day.' I respect his opinion because I know he's a really smart guy with a quirky sense of humour. If something's going to fail, he's going to pick it out right away. He's my first editor. There's real support on the home front. Devon and Brian tease me when a deadline is coming: 'Oh, oh! Deadline coming. Stay away from Mom for the next three days.'" Marriage hadn't immediately followed Linda's studies at the U. of T. "I went back to the library where I'd worked since I was 13. Without a library science degree, I was the Assistant Children's Librarian in Melrose. For a year, Cal and I did a correspondence romance. Still working on his thesis at that point, he'd come and stay with my family, and we'd get him a library pass to use Harvard's library. Then I'd go and stay with his mom, and so we'd visit back and forth every three months. We had horrific telephone bills and wrote hundreds of letters. I wanted to pay off the education loan before we got married, and a good thing I did. When we married, even though I had a teaching certificate from the States, I couldn't teach in Ontario because I didn't have the right qualifications. I thought, 'I can work in a bookstore,' and the last place I put in an application was the Children's Book Store. I was hired and worked there for a year before leaving. That's when I began 17 years of reviewing for Quill & Quire as well as doing window dressing in books stores and freelance newspaper ads for book stores." "One day, I went to the Canadian Booksellers Association conference for Q&Q, and Ricky Englander from Kids Can called out, 'When are you going to stop writing ABOUT children's books and write one yourself?' I thought, 'I'm stupid if I turn that offer down.' All About Niagara Falls came out of that chance meeting. When I started digging around, I found so much information that Niagara could have been 16 times the size it was. There's an entire railroad history and reptile history. There were more snakes and ferns at the Falls than anywhere else on the planet, including the Amazon. There's the native lore, just tons of it, but you're always limited by the ultimate number of pages and that's frustrating because there's always so much more you want to include." 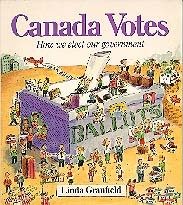 "Canada Votes came about because Kids Can asked me if I thought I could do a book on voting. I said, 'Let me fish around for a while and see if I can make it interesting.' I went and got all the government documents, and, of course, they were boring. 'This is what they send out to schools? I can hardly understand anything.' Then I started playing around with where we got some of the terms used in the political process, expressions like 'lame duck.' I thought, 'There's stuff that can make it more interesting.' After the book came out, we found that there's a secondary audience, English as a second language adults and new citizens. With government changes, every two years I have to go back and update it. If I take 10 words out, I can only put 10 back in because Kids Can can't reshoot the whole book. Social Credit was a half page, and now it's down to almost nothing while the Reform section had to be enlarged. Changes mean the index has to be re-done too. For the next two years, I'll be cutting any articles out of the paper on anything to do with elections so that, when I have to do the next change, I'll have a volume of start-off material. I go into some schools, and they're still doing their reports from the original 1990 edition, and there have been five undated editions since." 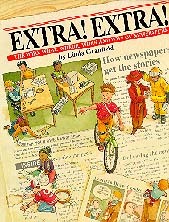 The idea for Extra Extra was Linda's, and the book has a special family connection. "While working on it, I said to my husband, 'I'd love to interview an old paper boy. Maybe I should go to one of the local senior residences.' 'What are you talking about?' Cal replied. 'Your father's the right age. Why don't you interview him?' My dad wasn't much of a storyteller, but I called him. 'You were a paper boy during the Depression. Could you tell me about it?' He stayed on the phone for two hours, and I had to greatly edit his story. He talked about things like his coat being so frozen that it could stand up on its own, and how people cheated him out of money because it was the Depression and they couldn't pay, but they needed the paper to look for a job. I hadn't known about the bike which was in our basement when I was growing up. This bike, covered in coal dust, was in the corner where the coal cellar had been. For 60 years, Dad kept that bike he'd bought with his paper money. No one in the family would have known the bike's origins if I hadn't needed the paperboy story, and the bike probably would have just been chucked out when we cleaned out the house after our parents passed away. Today a brother has the bicycle." A The-Make-Your-Own-Button Book was Andrea's concept. She had the artwork but felt she wanted more on the historical side. She asked me to help her out for a couple of weeks which ended up being a couple of years by the time the book came out. It was an interesting project, but I'm not too keen on doing craft books. I'd rather not write nonfiction as 'Here's a book on slavery, and so now let's build a slave ship!' That said, while the newspaper book had a recycling/crafts portion, the projects made sense because at the time there was a big push on recycling. I can't say I'm looking to write more craft 'recipes.'" Writing Cowboy: A Kids Album, which was the 1994 recipient of the Roundtables of Canada's Information Book Award, must have been predestined in Linda's childhood. "When I was four, I used to watch Roy Rogers on television, and I thought I was Annie Oakley. For Christmas, my mother, who was very creative, made me a complete Annie Oakley outfit. The cowgirl shirt was made out of one of my dad's old white work shirts, and my mother used a red oilcloth table cloth to make a skirt with a white oilcloth fringe. I was talking with Groundwood's Patsy Aldana about writing biographies, and we got off topic and started talking about our kids being into cowboys. The next morning, Patsy called. 'You know how we were talking about cowboys yesterday? I haven't got it out of my brain.' I replied, 'I haven't either. All night I was saying to myself, AI'd love to do cowboys. You could do this. You could do that. @' Patsy said, 'How about we do cowboys?' So, by 9:00 a.m., Cowboy was on its way. When I went to get permission for a picture of Roy Rogers and Dale Evans, I called the Roy Rogers Museum in California. I was chitchatting with Roy Rogers' agent when he asked, 'Did you watch Roy Rogers?' Replying that I had, I admitted being jealous of Roy's kids on that show, including Rusty. The voice on the phone started laughing and said, 'I'm Rusty.' When he learned the book was for children, he said, 'There'll be no fee to use that picture of my mom and dad.' They were the only people who gave permission for free use of a picture. Since Cowboy, I autograph more books for adults than children. I call what I'm writing 'family books' because of my growing adult readership. "It took nine months of research to do each of The Year I Was Born books. Having seen a similar project that was done in England, I approached Kids Can with the idea. That was the Gravol period in my life because I was working on microfiche machines for hours. Those machines are built incorrectly: to work the button, you have to be so close, and then you have to push back for the visual. I had an upset stomach every day I did research. I used the Mississauga Public Library, and I'd go for a half day at a time with special permission because the library had a one hour limit on the machines. A bagel lunch at the library settled my stomach before my drive home. I was reading everything but the obituaries. I used different newspapers from around Canada. Each Year book looks like such a 'quick' little book, but each took a massive amount of work. Since Bill Slavin was doing all the illustrations, at the same time I was reading and gathering information, I photocopied the illustrations that went with the stories so Bill would have visual references. From 1992-1997, I was cutting the daily papers and magazines and gluing the clippings into scrapbooks so that I could write those books. Pat Hancock joined the project so that we could do more, but frankly they didn't sell the numbers that you need in order to sustain the series. I'm still asked when more years will come out. Sorry to say they won't." "In Flanders Fields is almost exactly what my proposal was. In 1994, I was watching the D-Day anniversary events, including that television scene when those veterans walked across that beach. I was crying my eyes out, and, for some reason, 'Flanders' popped into my head. 'I'd like to read that poem again,' I thought, because I'd read it but didn't have it totally committed to memory. I also recall thinking, 'Every time I want that poem, I have to go to the library and dig through a poetry collection to find it. Wouldn't it be nice if it was in a book with a map of Flanders and information about McCrae?' I put those ideas into a letter to Kathy Lowinger, then at Lester. Before the letter arrived, I saw her at a CBA gathering. 'What have you been up to?' she asked. I replied, 'Actually, you're going to get something in the mail from me.' 'Tell me now,' and I started telling Kathy but didn't get half way through before she said, 'We're doing it. Hurry up!' I put a halt on everything else and worked on Flanders. I don't want to get involved in the revising of history. I try to report and reflect what was going on at that specific time. I was a bit worried with Flanders because I was sticking to the view of the day which was, ' This war is super. We can't wait to be part of it.' I felt there would be a backlash, and I was surprised there wasn't. Obviously people understood it was Zeitgeist, and that response partly gave me the courage to go and do another war book." Circus may also be rooted in Linda's childhood. 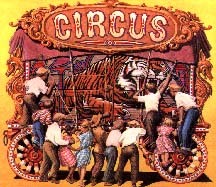 "We never had the circus come to town, but we ran a neighborhood circus as kids. Though the circus only took place in a couple of hours in one afternoon, we worked all summer on it. My mother had to keep all of us occupied all summer and not much money to do it with, and so the plan always was that we would have a circus during the last week of August. We did all the artwork. Because this was before photocopiers, we had to hand do every poster and handbill. There must have been a one mile radius we'd walk to hang up all these signs for just this one afternoon. Having established the date, we'd get other kids in the neighborhood to be performers. This circus was a total family effort. An excellent seamstress, my mother would take old sheets and make clown costumes or whatever we needed. After work, my father would saw the holes for the bean bag toss, and then we'd paint the whole board, and my mother would help us sew the bags. She'd make popcorn, and we'd bag it in the little waxed paper bags. On 'Granfield's Circus' afternoon, there'd be kids lined up out our driveway, school kids and mothers bringing babies in strollers. There were 22 children our age just on our block. We'd also have a side show with acts like 'the crazy baby' from wherever, which was just someone's baby brother bawling his eyes out. We'd charge a nickel to get in, and each year we'd pick a charity, and that's where every penny went. The highest amount we made was about $75.00,a lot of money in the >60s. The big thrill was if the city paper would come and cover it, and they did. At the back of Circus, you can see part of the clipping of one story the paper did. Also, if you look on the Circus page with the combination of pictures, I'm the one with the too long legs sticking out of the pants. I'd outgrown them, but I needed those turquoise pants to be the ringmaster. We ran a summer circus for about four years in a row until I got into junior high and decided 'I'm not doing this any more. This is not dignified.'" "Amazing Grace was the result of a brainstorming session at Tundra. Somebody mentioned the words, 'Amazing Grace,' and I said, 'There's some story about the guy who wrote that having been a slave trader. I'll go look into it.' Once you start researching a topic, it's surprising how much you find that's accepted as true but isn't. And you think, 'If they'd just researched five minutes longer, they would have found out that that wasn't so.' For example, with John Magee, some of the websites have him dying in the Battle of Britain, and that battle was over before John even signed up." Because of mistakes in published sources, Linda says the Magee family was most concerned about accuracy. "When I first contacted John's brother David, he kept insisting on seeing the book before it went to print. Later I found out the reason was that an English publication had put out a John Magee biography which was filled with errors." "Silent Night grew from Flanders. While researching Flanders, I'd come across the story about 'Silent Night' being sung in the World War I trenches on Christmas Eve. I filed it aside thinking, 'That's something I'd like to look up again.' Then I started coming across all these different variations about how 'Silent Night' came to be written, and you could tell some of them were bogus history, strictly made-up stories. The book's wonderful illustrations came about because Kathy Lowinger had seen the Hofers' artwork on a little note card in Guelph. Silent Night's their first book. Full-time soy and dairy farmers, they create their art in winter when they 'just' have to deal with the cows. That artwork is just phenomenal because it's single pieces of paper. When the Hofers were children in Switzerland, they started learning the folk art of scherenschitt (the German word for silhouette)." 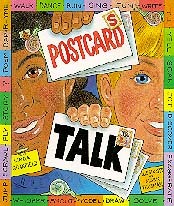 A Postcards Talk started out as a book for teachers and that's why I went to Pembroke who did educational publishing. Because I was using so many postcards in research for Cowboy and other books, I was being asked to talk to groups of teachers about research, and postcards were a big part of it. I thought, 'Why don't I do something for teachers to answer these questions they have?' Then, as we got editing Postcards, it started shifting into a kids' information and activity book. Mark Thurman's illustration's are a joyful mix of archival and invented postcards." 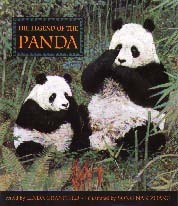 With The Legend of the Panda, Linda became a reteller, but the book had its roots in her nonfiction. "I wrote an article on raccoons for Owl magazine, and while I was doing the research, I came across a footnote about a legend of the Wolong Valley that said it was because a girl had died that pandas had the black marks on their coats. Finding that interesting, I did more research. When I wrote the manuscript, I didn't have a name for the girl because, not knowing Chinese, I didn't want to give her the wrong name. I wanted an appropriate name, and so she was just the 'shepherdess.' Then, when the illustrator, Song Nan Zhang, who grew up in China, sent in his thumbnail sketches, I looked at the tiny pencilled-in face and thought, "She's real to him, and she has a name.' I called him and asked,'What's her name?' He said, 'She looked like Dolma to me which means "the beautiful one" in Tibetan.' And so I had the name with its proper meaning. The story's not just the life of the panda and the girl. It's also about what the area's like that supports these pandas and the beauty of what's being destroyed when developers remove the bamboo. I didn't want Panda to be heavy handed 'message' book, but, through the illustration, young readers see that this is terrible destruction on a number of levels." A different nonfiction "publication" was Linda's involvement in a quiz game. "Thomas Allen and Sons were the distributors of BrainQuest from the States, and people asked, 'Is there one about Canada?' There wasn't, and so I was approached to do that project, but, with a very short time frame, I asked Pat Hancock to work with me. That project had its own challenges because we had to develop over 1000 questions and answers about Canada. Everything has to fit into a little spot on the card, and you can't have more than one answer to a question. We learned how to be really tight writers. There will be an up-dated version of BrainQuest Canadain 2001." The genesis of High Flight actually occurred in a doctor's office. "When I went to the family doctor with one of my children, I gave her a copy of Flanders. As she was flipping through it, she said, 'I love this poem, but the one that always makes me cry is "High Flight."' And that was it. I'd been wanting to do a World War II book because I'd seen the links being made between kids and veterans after Flanders." Many people were likely surprised that Michael Martchenko illustrated High Flight as his name is usually associated with Robert Munsch. Linda explains: "About six years ago, the editor of the CANSCAIP Newsletter, asked me to interview Michael for the "Profile@ section. Not having really met Michael before, I made an appointment and went over to his house. We talked about his life history and art, and, as I was leaving I saw a painting on the landing of a World War II plane over a French landscape, I asked, 'Who did that?' Michael said, 'I did.' At first, I thought he was teasing me, but then he said, 'Aviation art's my passion.' I put that information into the article, and then, when I knew I wanted to do High Flight, Michael was a natural as the illustrator. My son posed as the body model in WWII uniforms that Michael owns. We'd like to do another book together." Linda's research for High Flight was so meticulous that she discovered information unknown to the Magee family. One of her significant discoveries was that "High Flight" had been printed prior to the popularly accepted date. "On a faxed photocopy I had of an undated newspaper article, it said something about John's having died, and so I knew it had to be late 1941. They printed 'High Flight' at the bottom, but the line right above the poem said, 'Even though we repeat the poem here,' and I'm thinking, 'What does that mean, repeat the poem?' Then I read the rest of the article, and it said something about, 'We printed the poem November 12th , and now that he's dead we'll repeat the poem here.' The name of the paper was ripped off. So then it was like being a detective. John's parents had lived in Washington, and I had a Washington Post article, but the font wasn't the same. John had an aunt from Pittsburgh, and so I found something else that was in the Pittsburgh Post Gazette, and the font matched. I made a phone call which ended up confirming the poem's earlier publication. That's one of the days when you just jump up and down, shrieking and calling everyone you know, saying. 'Guess what? John's poem....' There were a lot of dead-end things I wish I could find. Copp Clarke did the 1950's textbook in which most Canadian kids first encountered 'High Flight.' I thought, 'Where did they get the poem for it?' I bought a copy at an antique store and read,'Kind permission of Rev. & Mrs. Magee.' I thought, 'They must have written a letter.' I called Copp Clarke in Toronto, but, when they moved the company from one location to another, they threw out all the old paper. I just know it would've been a terrific letter about how important they felt it would be that kids would be reading his poem." Linda's work on the war books and their publication has brought her into close contacts with veterans, and, "with every project, I gain more respect for these people who did so much and are getting older. One spring when I was going to a school to talk about Flanders, I wanted to give the students some poppies, but it was 'out of season.' I went to a local legion to see if they had some and got chit-chatting with the legionnaire who was looking for them. When I went to leave, he walked me to the door. He'd been a real jolly soul, but, just as we got to the door, he grabbed my arm and stopped me. He bent near my ear and whispered, 'Don't forget us.' The way he said it choked me up, and I almost couldn't answer him. The veterans do feel forgotten, and obviously it's because we cram everything into that one November day and the rest of the time they're nowhere in our lives. The kids just see the old man down the street. Part of the appeal of doing the book on John Magee was that he was young, just 19, and kids could see their grandparents as young men. We can't hear John's voice, but we can at least hear the voices of those who are still with us. My big dream is to get some program going across the country that would pair off students and veterans. The students would collect the veterans' stories, and at the same time develop new friendships. A lot of the seniors don't have children. There is no one in their family to tell a story to if they choose to. I'm also trying to promote the idea that every day is Remembrance Day. Talk about and invite veterans to schools in April, not just November." Researching is an enjoyable activity for Linda, but bringing the research process to closure can be a problem. "There always the dilemma: What if I stopped today and I might find something else tomorrow? If I didn't have a deadline, I'd just keep going because of the 'What if?' factor." A concrete example was Linda's "High Flight" publication discovery, but even that success is qualified by the "what if?" and Linda finds herself still questioning. "If I'd had two more weeks, maybe I could have found something else that would prove that John actually saw his poem in print. Maybe his Philadelphia aunt cut it out and sent it to him.' Actually, on none of these books do I ever stop. I still collect material on Circus and Cowboy even though I know the books are published. With an eye to yet unborn projects, Linda collects future research materials. "I've got eight lateral file drawers full. Everywhere I go, I pick up brochures because I can get email addresses or phone numbers or something interesting. I have a whole room of bookcases and lots of notebooks. Every night I rip articles out of the paper, and, whenever I have a free bit of time, I file it. Right now, there's about a foot high stack of articles to be filed. That's an ongoing thing, and it refreshes me. When I start filing, I get more ideas or get refamiliarized with the material I have. I also collect ephemera. If McDonald's has a new French fry container, I'll ask for one because that's popular culture. I keep maps that are too old because they can help me do period research. I'm a big time collector of inexpensive paper bits." "My newest book is Pier 21: Gateway of Hope, about Halifax's Pier 21. The restored building, a National Historic Site, has been called 'Canada's Ellis Island' and it re-opened in July of 1999. The immigration/war brides/refugee subject seemed fascinating, and I mentioned it to Tundra. We contacted the museum figuring that there must already be something in the works, but there wasn't. Interestingly, Pier 21 crossed over with John Magee because he left from Pier 21 with the troops on the USS California. Every single book seems to be in some way to overlap with some other project I've done which is the fun of it all." Future projects include a companion book for Flanders and other war books. ASo many people have asked for more information about World War I, so this new book is a natural progression. It will be another 'family' book, presenting archival materials and history for young readers and adults alike. Writing books about "tough" subjects can elicit varied responses. "After I finished a school presentation, A grade five boy and girl walked up to me, and the looks between them indicated something was up. He said, 'My teacher says your books are gruesome.' I said, 'Oh, that's interesting,' and the girl's nudging him. 'What books would your teacher be talking about?' I asked. 'Flanders and the slave book.' And I replied, 'Why does she think they're gruesome?' 'Oh, because the slaves were sick, and the babies were thrown out. And you have war in your books.' I responded, 'Do you think those things really happened?' 'Yeah,' he said. 'If it really happened and it was gruesome, then I'm going to tell you. So you go back to your teacher and tell her that her comment was a compliment because it means I told real things and you got the message because you remembered it all.' I'd love to have seen the look on the teacher's face." History's filled with a lot of unhappy stories, and that's one reason why, on the Magee book, it says 'A Story of World War II' because there are millions of stories dealing with 18 and 19-year-old boys and girls from that war." Self-censorship can be one result of objections to content. "Where I don't censor is vocabulary. I figure if readers don't know a word, they can look it up, or they should know from the context what it means. But, in dealing with slavery in Amazing Grace, I had to be careful to choose the right words, not in the sense of what's called 'being politically correct,' but some of the scenes are highly emotional. You know adult readers can take it, but you don't want to hurt a young reader. That was also especially true with the war books. In High Flight, I left in the part about John's having the broken neck because I really didn't want kids having nightmares about this boy that they were now attached to going down in flames. Being truthful and yet not hurtful to somebody, that's the hard part of it. Every book presents new challenges, and it just wouldn't be worth writing at all if those challenges weren't there. I just move on to the next one . . . and hope I'm touching someone." 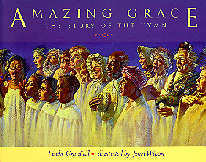 Amazing Grace: The Story of the Hymn. Illustrated by Janet Wilson. Tundra Books, 1997. ISBN 0-88776-389-8. Grades 4+. Canada Votes: How We Elect Our Government. Illustrated by Craig Terlson. Kids Can Press, 1990. ISBN 1-55074-884-X. Various updated editions. Grades 4-9. Circus. Groundwood Books, 1997. ISBN 0-88899-292-0. Grades 4+. Cowboy: A Kids Album. Groundwood, 1993. ISBN 1-55054-230-3. Grades 4+. Extra! Extra! The Who, What, Where, When and Why of Newspapers. Illustrated by Bill Slavin. Kids Can Press, 1993. ISBN 1-55074-122-5. Grades 3-7. High Flight: A Story of World War II. Illustrated by Michael Martchenko. Tundra Books, 1999. ISBN 0-88776-469-X. Grades 4+. In Flanders Fields: The Story of the Poem by John McCrae. Illustrated by Janet Wilson. Lester 1995/StoddartKids, 1996. ISBN 0-7737-5925-5 (pbk. ), ISBN 0-7737-2991-7 (cl.). Grades 4+. The Legend of the Panda. Illustrated by Song Nan Zhang. Tundra Books, 1998. ISBN 0-88776-421-5. Grades 2-6. 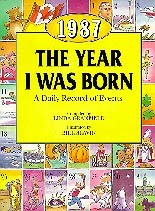 1984, The Year I Was Born: A Daily Record of Events. Illustrated by Bill Slavin. Kids Can Press, 1996. OP. 1987, The Year I Was Born: A Daily Record of Events. Illustrated by Bill Slavin. Kids Can Press, 1994. OP. 1988, The Year I Was Born: A Daily Record of Events. Illustrated by Bill Slavin. Kids Can Press, 1995. OP. Pier 21: Gateway of Hope. Tundra Books, 2000. ISBN 0-88776-517-3. All ages. Postcards Talk. Illustrated by Mark Thurman. Pembroke Publishers, 1998. ISBN 1-55138-033-1 (pbk. ), ISBN 1-55138-032-3 (cl. ).Grades 3-9. 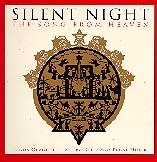 Silent Night: The Song From Heaven. Illustrated by Nelly and Ernst Hofer. Tundra Books, 1997. ISBN 0-88776-395-2. Grades 3+. von Konigslow, Andrea Wayne. The Make-Your-Own-Button Book. Illustrations by Andrea Wayne an Konigslow. Somerville House, 1993. OP. This article is based on an interview conducted in Winnipeg, MB, on October 16, 1999.